With Easter just around the corner, eggs, bunnies and baby chicks in traditional pastel colors seem to be showing up everywhere. Cartoonish characters alone are enough to trigger thoughts of chocolate eggs and bunnies, and here are some new releases for April 2019 that will help players get into the Easter Spirit. 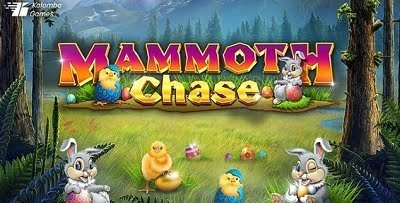 Mammoth Chase Easter Edition Slots is a recently re-released special edition from Kalamba Games, an Easter-themed take on the popular Mammoth Chase Slots that has already been out for some time now. Although this release isn’t exactly ground-breaking, players will enjoy the festive feel and addition of new imagery, as well as the high-paying symbols from the original game, along with the progressive jackpots that made Mammoth Chase popular in the first place. And who the heck doesn’t want to look at all those cute bunnies while they’re chasing cash prizes! Moving in a bit of a different direction, those looking for some Easter fun may also want to check out Chicken Fox Slots, not Easter-themed per say, but with the cartoonish characters we’d expect from a holiday-themed title. Unlike the other Easter releases coming out this month, many of which are modified versions of original machines, this one is totally unique. From software developer Lightening Box, Chicken Fox Slots will remind you of Looney Tunes, with a Sylvester and Tweedy style cat and mouse game. This could be enough to capture the attention of those just looking for a spot of animated fun. This one will take you back to your childhood, with symbols that include an old lady, a fox, white eggs, and golden eggs. You’ll be cheering on the sneaky fox patrolling around the hen house because if he’s able to catch the chicken, this could trigger a batch of free spins and tons of extra prizes. The bonus rounds perfectly compliment the action and things really move at a nice pace. There are probably more Easter-themed games being released this month and these are just the start of what could be an avalanche. So to check out these two great machines and many more, hop on over and open a new account at Casino Cruise today and start grabbing some treats! They’re currently offering a huge $1,000 welcome package and that will certainly buy a few chocolate eggs.